Welcome to the next generation of training materials for Carlson Survey, the Practical Guide. This courseware is an essential resource for all surveyors and survey technicians utilizing Carlson Survey to perform all types of survey calculations and deliverables. 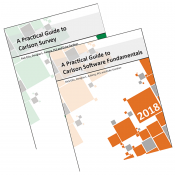 Critical components of Carlson Survey are covered in a clear and comprehensive approach that enables the reader to quickly learn these key topics and effectively put them to use in their daily workflow. Each lesson contains a discussion of the background of the topic and its real world applications, followed by step-by-step exercises that demonstrate how to make them work for you. 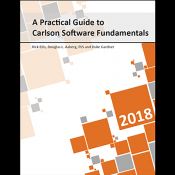 This text builds on the foundation of knowledge established in A Practical Guide to Carlson Software Fundamentals 2018. While a mastery of the material in that book is not mandatory to the successful completion of this text, it is highly recommended as a prerequisite to this courseware. Together the set of two books totals almost 800 pages of detailed training content, including 71 lessons and 163 hands-on exercises, making them the definitive resource for learning Carlson Survey. A Practical Guide to Carlson Survey features 83 exercises organized into 37 lessons in 7 chapters. Each lesson includes detailed descriptions of processes and theory with many illustrations and diagrams, to help you understand “why”, not just “how”. This new Carlson Survey 2018 book focuses on effectively using this powerful software, providing you with skills that other professionals are using in the workplace every day. If you have a previous version of this Carlson Survey book you will still want this new 2018 copy. We have added 110 pages of new content, mostly in the area of Field to Finish with 21 new exercises in 4 new lessons, making this the definitive resource on the topic. This book has 470 pages, organized into 7 chapters, in a large-format, spiral bound volume.